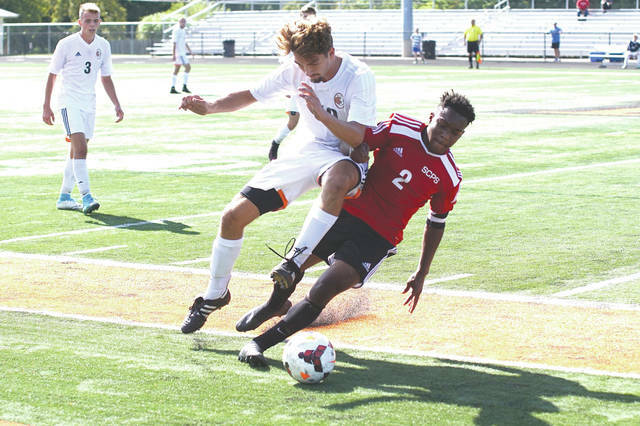 BEAVERCREEK — A season ago, Columbus St. Charles provided the only two losing blemishes to the Beavercreek boys high school soccer program’s schedule. On Saturday, the two teams played to a 1-all tie on Frank Zink Field. St. Charles ended Beavercreek’s 2016 campaign with a 2-1 win at Xenia’s Doug Adams Stadium in the Division I state semifinal match. The Cardinals, who had beaten Beavercreek by a 3-1 count in Columbus during the ‘16 regular season, then lost by the same score to eventual state champ Cleveland St. Ignatius. 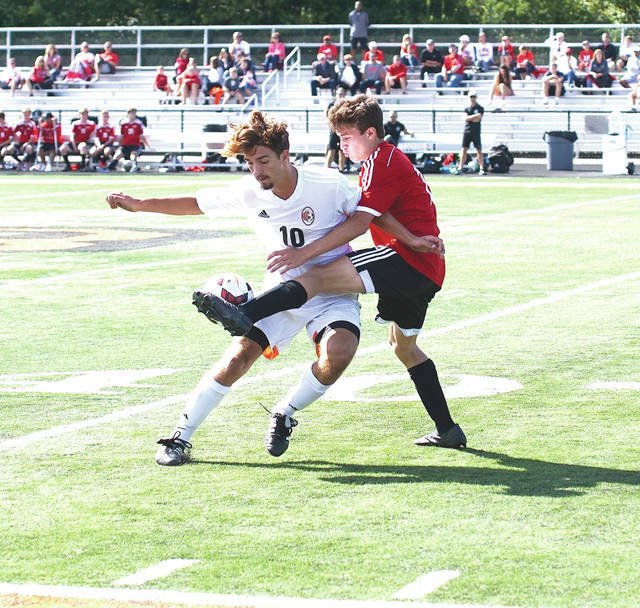 With memories of the last two matchups between St. Charles (4-1-1) and Beavercreek fresh in both school’s minds, Saturday’s match promised to be intense. “We knew today was going to be a good test for us to find out exactly where we were. I think we learned. That’s exactly why we play these games,” Beavercreek coach John Guiliano said. According to the veteran coach, the Beavers learned how to mark their opponents better on St. Charles’ set plays. Cardinals senior captain Ian Smith got the pass, then drove to his right before knocking in a right-to-left shot for the score. Beavercreek (4-0-2) had held the lead up to that point. Twenty two minutes into the half, co-captain Daniel Donohue fired a shot that bounced off the St. Charles goal’s crossbar, but Beavers senior midfielder Ryan Cameron was perched on the right side to score on the rebound. Throughout the scoreless second haqlf, whenever one of the teams appeared to mount an offensive attack, the other team’s defender was there to poke the ball away. St. Charles’ defenders had a talent at having one player chip at the ball while a ‘Creek player had it, only to have a second Cardinal defender jump in to take over possession. 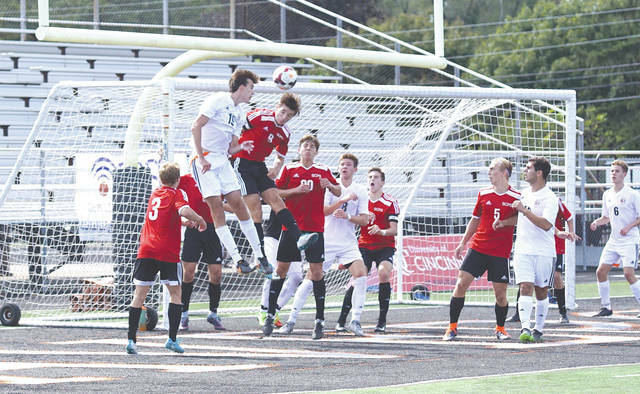 Beavercreek is back in action on Tuesday, Sept. 12 when they’ll host Greene County foe Bellbrook for a 7 p.m. non-league match. The Beavers will then return to Greater Western Ohio Conference action on Saturday, Sept. 16 when they’ll host National East division foe Springfield for a 7 p.m. contest. St. Charles’ senior wing Paul Hensley (2) collides with Beavercreek’s Evan Williams as the two players chase after the ball, Saturday Sept. 9 in a boys high school Division I matchup. Hensley was later given a yellow card for rough play. Beavercreek senior forward Kevin Davis (19) and Columbus St. Charles’ senior defender Ian Smith go up for the ball in front of the St. Charles goal, in an eventual 1-1 tie, Saturday Sept. 9 on Frank Zink Field. Columbus St. Charles sophomore defender Tyler Cunningham kicks the ball in front of Beavercreek’s senior forward Evan Williams, during Saturday’s Sept. 9 boys high school soccer match on Frank Zink Field in Beavercreek. The two teams played to a 1-all tie.